In small bowl, mix chicken and pepper sauce until well coated. Spread 1 tablespoon cream cheese over each rectangle to within 1/4 inch of edges. Sprinkle evenly with chicken, blue cheese and chives. Starting with one short side, roll up each rectangle; press edges to seal. With serrated knife, cut each roll into 6 slices; place cut side down on cookie sheet. Bake 13 to 17 minutes or until edges are golden brown. Serve warm. 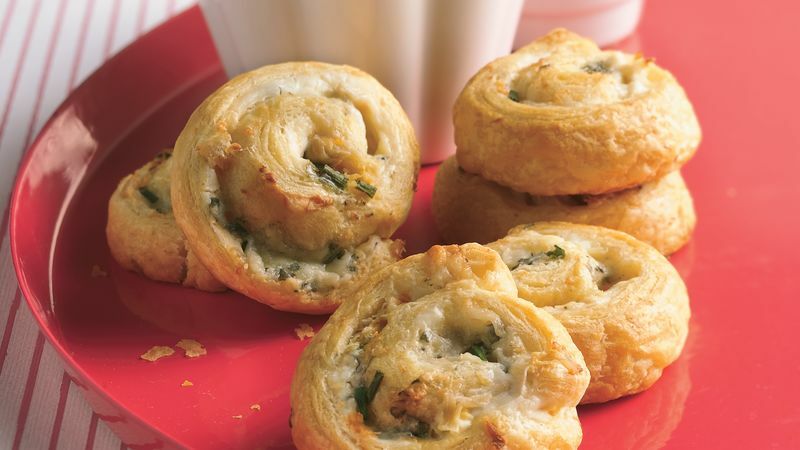 Prepare and bake these appetizers up to 24 hours ahead of time, then cover and refrigerate. Before serving, place the appetizers in a shallow pan and cover with foil. Heat at 350°F for 10 to 15 minutes. Round out the buffalo with blue cheese dip and celery sticks.